Today, Nov. 9, marks the 25th anniversary of legendary New York City rap collective Wu-Tang Clan’s debut album, Enter the Wu-Tang (36 Chambers), and the group has been celebrating the occasion all day. They began with a heavily censored performance of “Protect Ya Neck” on Good Morning America before sitting down with anchor Michael Strahan for an interview. 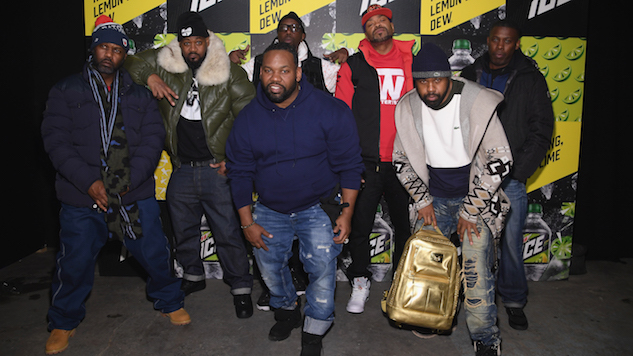 During that, it was proclaimed that Nov. 9 is officially “Wu-Tang Clan Day” on Staten Island. Check out the performance below. Continuing the celebration, the collective have released their short film collaboration with Certified Classics, now streaming on YouTube. The documentary, titled For The Children: 25 Years of Enter the Wu-Tang (36 Chambers) and announced earlier this week, looks at the founding of the group, the creation of Enter the Wu-Tang and its lasting impact now, 25 years later. It features the members of the collective, as well as guests such as A$AP Rocky, A$AP Ferg, Gary Vaynerchuk and Joey Bada$$, to name a few, and was directed by Shomi Patwary, with Ashima Aiyer serving as creative director. To further commemorate the anniversary, Certified Classics is also releasing a limited pressing of the album’s third single, “C.R.E.A.M.,” on a record that, insanely enough, is die-cut in the shape of the Wu-Tang logo. Today’s events follow a slew of news involving the group as of late, from their collaboration with Milk Makeup on a cosmetics line earlier this month to the October announcement of a forthcoming Hulu-produced origin story. Check out the short film below and revisit Paste’s 2011 feature on the collective’s de facto leader RZA here. Find a performance of “C.R.E.A.M” from 1999 further down below.